To celebrate the Middle East premiere of Star Wars: The Force Awakens in Abu Dhabi on Wednesday 16 December, twofour54 and Aldar Properties PJSC have partnered to create a giant Star Wars-themed installation. 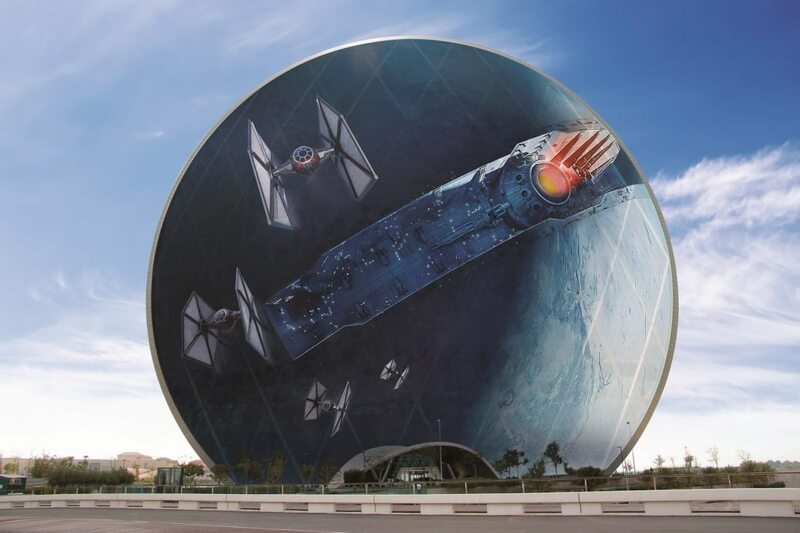 The 100-metre high installation is placed on the iconic, coin-shaped Aldar HQ building and features the Starkiller Base from the latest episode of the blockbuster franchise. Those keen to find out the story behind the giant image have had to wait until the film opened in cinemas last weekend, as no details were revealed in advance. With assistance from twofour54 and the Abu Dhabi Film Commission, filming for Star Wars: The Force Awakens took place in Abu Dhabi during May 2014 with over 650 crew working across two locations. In Star Wars: The Force Awakens, Abu Dhabi plays Jakku, a frontier desert planet in a remote section of the Outer Rim Territories. Star Wars: The Force Awakens is the seventh installment in the franchise and is anticipated to be one of the most successful films of all time. So far, it has smashed all records for advance ticket sales in the United States. Star Wars: The Force Awakens was released in UAE cinemas on 17 December 2015.